The Sacrifice was Andrei Tarkovsky's last film, made just before he was diagnosed with cancer and released while he was dying. Having now seen a slim majority of the master's films (and all of the ones which are most often acclaimed - save Nostalghia) I wouldn't rank this as one of my favorite Tarkovskys, though it was - as always - an interesting and often rewarding viewing experience. It's somewhat different from his other films in mood and style. Though his serious, slow, at times lugubrious aesthetic was never what when one would normally describe as "youthful", there's a painfully taut romanticism and intensity to his earlier films, a kind of breathlessness of expression which make their auteur appear a brash, bold enfant terrible. But The Sacrifice is somehow more stately, more mournful, less throbbing with the expressionist anxiety of young genius. It's a film of maturity, of regret, of decline - the characters are all older than the usual Tarkovsky protagonists, the camera style is more removed (despite the usual dreamlike black-and-white Tarkovskian interludes which Lars von Trier sought to evoke in Antichrist), and the scenario - both the setting and the story - more spare, if at times apocalyptic. It feels like the film of a dying, or aging man, and though Tarkovsky was only fifty-three at the time, perhaps he sensed his impending illness. At any rate, he had been in exile for years now and the intensity of his method and his sensibilities must have taken their toll in the twenty years since the tumultuous Andrei Rublev. I haven't seen Nostalghia, but Stalker - the film before that - still holds that mystical belief in transcendence which Sacrifice seems to cast doubt on (its God is a more hidden, removed one, as befits all the Bergman references). And its brooding intensity still maintains the mark of a passionate brilliance, even if the precociousness has faded somewhat. The Sacrifice, like its main character Alexander (Erland Johannsen), an artist past his prime, does not feel "in the thick of things" the way most of Tarkovsky's previous films did. It's a film of looking back: both explicitly in its text and in the way Tarkovsky strips things down and changes his style up, no longer seeking the same rapturous heights he did earlier. Except...and here's the big BUT...Sacrifice contains one of the most bravura set pieces I've ever seen in a movie, a closer that could stand alone as a demonstration of what cinema, and in particular the cinema of the long take (one notion of pure cinema) can achieve. Alexander sets his house on fire, in fulfillment of what he believes has been an answered prayer - in a long shot, with a camera tracking horizontally while it follows, loses, and re-discovers both the burning home and the paltry human figures in front of it. I'd actually seen this sequence previously and was just as impressed then: seeing it in the full context of the movie only reinforces its uniqueness. 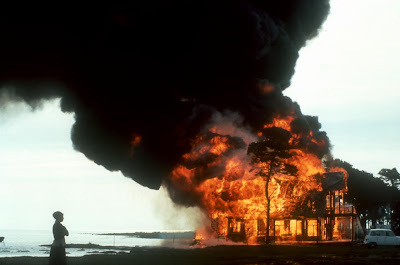 As an image of destruction it is a fitting coda to Tarkovsky's career, and serves as a kind of fantastic reminder that, however otherwise restrained, the old Andrei still had it. Almost as if after flirting with talky anxiety and fearful confinement for two hours, restless with the results, the godlike Tarkovsky of yore stepped in once again to hurl lightning bolts down upon the little world he had created. Watching the fascinating documentary which accompanies the film on DVD, we see Tarkovsky actually shooting this scene and are instantly reminded of the young bell-caster in Andrei Rublev, who risks death upon failure and whose nervy tenacity in going forward (despite catastrophic doubts which he keeps to himself) is both inspirational and terrifying. Of course, Tarkovsky - unlike the craftsman of his film - does fail, or at least his camera crew does with a malfunction that renders the entire expensive shot useless. Luckily he was able to rebuild the house, shoot it again and achieve the masterful results we see onscreen. Nonetheless, the analogy resonates because in the documentary we see him in the editing room, frail and sickly, wrapped up to keep him warm, with his head covered to hide the results of chemo therapy. Like the bell-caster he is facing mortality - and defying it in the creation of lasting art, the marshalling of human and natural resources to express a personal vision. The bell continues to toll, long beyond death. Wonderful. MovieMan. Works so well as a eulogy too. It feels as if Tarkovsky wanted to say out once and for all what had been restrained in his previous films (A seer once told him that he would make exactly 7 films!). The long take, as you eloquently describe, does wonders. We actually feel the dread instead of sitting there wondering about the shot. Indeed a wonderful review. Tarkovsky is for me truly one of the greats (and there are only three or four directors I would call great). I would put Mirror, Stalker and Ivan's Childhood at the top of his accomplishments. The final sequence is too 'bravura' for me - a stand-out showpiece separate from the whole and in which the camera feels too separated from the people. It started to become a little silly / unconvincing in the movements of the actors. It's too studied. There is a time in the works of all auteurs who have carved their own niche in Cinema when the niche may turn into a rut and a unique style may fall into self-parody. The image of the house on fire has a brute force much like that in Mirror but something about the story didn't gel. I love the bit where the camera pans from the house down to the identical model of the house, though. So powerful. Tarkovsky was a great loss to serious, thoughtful and spiritual Cinema. MovieMan, would you mind if I link to your dancingimage review of Spirited Away for a post of animated links in a week or two? jAFB, did you see the special feature on the DVD too - speaking of feeling the dread during the shot? If not, check it out! No, of course, link away, and don't worry about asking in the future - though if you want to let me know so I can catch the piece in question lest it slip through the cracks, that's certainly welcome. You are right that the fire sequence is perhaps too "bravura" for the whole film but that's why I liked it - and liked it more than the film as a whole. Also quite liked that shot you mention - where for a moment it seems like Erland might be God (when you just see his foot next to the house). There is a moment in the fire sequence which didn't work for me on first viewing, though I didn't mind it as much this time. Initially, I thought it broke the spell - up till then in felt in the thrall of genius. I think I know why too: it's the moment when the camera pans back to the house from the ambulance, and it's the first time the movement of the camera is not motivated by anything in the frame. But that's nonetheless a quibble with an otherwise masterful piece of cinema. As for the movie as a whole, as I suggested, Tarkovsky-doing-Bergman doesn't quite work for me, though the results are intriguing at least. "where for a moment it seems like Erland might be God"
It is a great review indeed of a film I've always admired, even if it's an unapologetic homage to Bergman. I prefer ANDREI RUBLEV, THE MIRROR and SOLARIS, but this is an important work as well. That's an ominous revelation of course that Tarkovsky's impending illness in his 50's, seemed to make this seem like a film from a "dying director."